confirmed even at these thicknesses. This block is used in the Center Aquatique de Valencienne, France as swimming pool disc. Cast acrylic sheets UV transparent in oversize! On demand of a costumer we studyed the possibitly to produce UV transparent sheets. 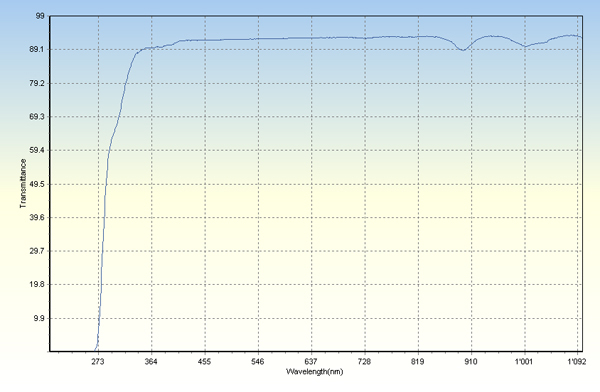 After some tests biacryl staff confirmed the modified production process. Material biacryl cast 6 mm UV pass. UV transparent from 270 nm. Offered sizes are 2450x3500 up to 5100x3100 in 6 to 10 mm. Wiith great astonishment our visitors at K2016 looked at our products. Those who did not know yet :::biacryl::: were glad to find out the extraordinary quality and sizes of our acrylic sheets and blocks. And even more amazing they regarded our energy efficiency. The decision for our sheets and blocks therefore means not only to use the best product on the market but also taking best care for the environment. Due to increased demand, we augmented the capacity for the format 3500x2540mm in the thicknesses 8,10 and 12mm to 300 pieces/year. The 12mm sheets are especially used for street furniture. These we will deliver in stock from Germany. Thus CMC Biacryl SA has according to our research due to the process for standard blocks the least use of energy and thus the lowest CO2 emissions of the industry !!! In the overall balance Biacryl has avoided 260 tons of CO2 over the past year, as Biacryl thinks not only of today and tomorrow. At the spectacualry construction site at Augustus place in Leipzig, the new construction of the Paulinum, the first section in the chancel is finished. The partition between the Paulinum chapel and auditorium was realized through four components out of :::biacryl:::. :::biacryl::: monolithic blocks up to 150mm! The first 150-monolithic block was produces successfully! From now on the formats 2050x3100; 4100x2000; 4100x3100, 5100x3100 are offered monolithic! The formats are available in thicknesses of 40mm to 100mm. The quality of :::biacryl::: convinces! Due to customer demand for quality standard formats :::biacryl::: now also offers the format 2050 x 3100 in the current standard thicknesses. :::biacryl::: laminates blocks to very big thicknesses! Especially for the realization of large aquariums, blocks with thicknesses up to 340 mm are required. :::biacryl::: expanded its production facilities to the lamination. Our understanding of lamination is the laminar bonding of 2 or more :::biacryl::: sheets with ethacrylic syrup, which is polymerized and temperature treated. Intended are sheets up to 3000 x 8000 x 340 mm. Reference: Zoo Zurich new construction of elephant complex, original sheet 3050 x 8000 x 180 mm, one lamination layer. After several years of developing :::biacryl::: started the mass production of oversize acrylic blocks on a new and own facility. The optimizing of the cell cast technology with high-quality oversize float glass sheets. Achieve a very consistent polymer made of 100% methyl methacrylate. The implementation of a high degree of flexibility in thicknesses and formats. Minimizing of production energy input. We have completed our first PV solar park with great success. Aquawindow to Bodensee Horn Switzerland. First realized a automatic permanent tideness control of sealing with air pressure. Construction of a continuous working PMMA sirop installation, starting of tests. New additional production facilities at Les Verrieres Switzerland. Ready to start autumn 2010. First sheet successfully produced on our facilitys. For several customers our size 5850 x 3100 was to small. Since the 1.4.2007 the moulds are changed on 6100 x 3100 mm for 10 to 25 mm thickness. Our own steal department realizes moulds and transport/handling constructions. 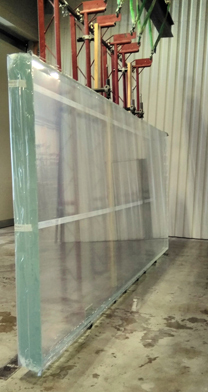 At our facility, aquarium panels are produced in all transportable sizes, the greater one will be assembled by site. Sheet 5000 x 4000 mm transformed to tunnel aquarium. Acrylic constructions until 9000 x 4400 x 4400 mm can be temperature treated. The big curved panels will first chemical bonded and then curved in one piece. For even bigger sheets we are using the mobile temperature treatment unit. The tendency for bigger growing aquarium panels made us develop the procedure "chemical bonding on site". The glue lines are nearly invisible connected: The procedure was tested on 6 meter high and 270mm thick acrylic blocks. The quality of :::biacryl::: convinces!